A thematic exhibition „Mother of God - Waiting” in the Days of Christian Culture in Oleśnica. The exhibition was held on 26th and 27th of November 2016 at Blessed Virgin Mary Mother of Mercy Church in Oleśnica. The night exhibition of icons and workshop during the Night of Museums in Olesno 14 May 2016. Subject was interesting for oldesr and youngers. There was a lecture, presentation, watching and a lot of questions about the workshop and the methods for creating icons. My contribution to the inauguration of the European Capital of Culture in Wrocław. 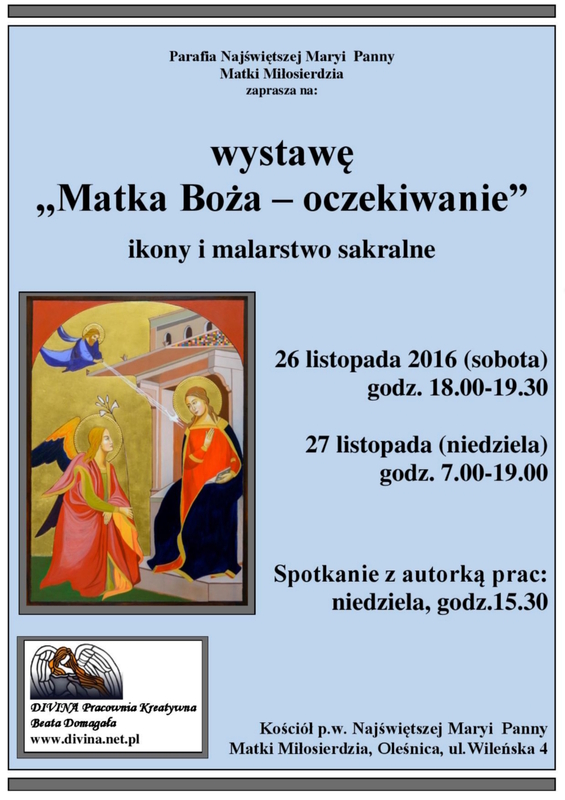 Mini exhibition on 16.01.2016 at the Redemptorists in Wroclaw - Parish of St. Mary of Consolation, Wittiga Str. On December 13, 2015 at the Church of the Blessed Virgin Mary of Sorrows in Wroclaw, Tatarakowa Str. 1 it was held an exhibition of my 35 icons and sacred paintings. These works are the achievements of the past 5 years. At the exhibition one could see a mini iconographic work place and read about the icons' history, techniques and rules of their preparation, symbolism or theology of icons. On 22-23 of August 2015 at the eighteenth-century Church of Saint Patryk in Edinburgh in Scotland it was held an exhibition of my icons. The church is located in the heart of Edinburgh's Old Town (40 High ST.Edinburgh EH1 1TQ) and is an active religious center of a vivid community. There is a chapel of Margaret Sinclear at the Church, a nun who was born in Edinburgh in 1900 and who devoted all her life to helping others, working and serving God. Exhibition of my icons was made during the month of the annual arts festival in Edinburgh „Just Festival”. It is a common name for several separate festivals, offering almost the entire August more than 300 plays, exhibitions, music, dance, workshops, etc. „Just Festival” is intercultural dialogue and breaking down barriers to the development of the community and the individual human being. Exhibition of my 28 icons was held on May 23-25 in church of Holly Heart of Lord Jesus in Kluczbork, John Paul II street no 7. Exhibited icons shown various themes - from icons of Christ and Holly Mother, icons of saints and patrons, Angels to expanded holiday icons, so called Prazdnik. Collective exhibition „MADONNY”, was held from December 8th till December 28th in ODSK „Piast”, Rękodzielnicza 1 Street, Wrocław. During the exhibition You could see works of several artists, made with different techniques. It includeded icons, oil paintings, dried flowers and leaves works, paint coated material works creating kind of relief and extremely labor-intensive works imitating mosaic technique. Exhibition opening took place on 7th December 2014 and was graced with performances of young artists and choir from ODSK „Piast” in Wroclaw. Event was lead by ODSK manager, Jolanta Macała. Held in the Regional Museum in Olesno, Jaronia 7 Street (marketplace side entrance). Exhibition lasted from July 19 to September 26, 2014. You could see copies of icons done by well-known masters, as well as other less-known works. Collective exhibition of painted silk in ODSK Piast in Wroclaw, Rękodzielnicza 1 Street. People working within painted silk studio of Bozena Milewska, presented their works inspired by nature, gardens and flowers. Spring weather and first warm rays of spring sunshine added charm and joy to this exhibition. Collective exhibition of painted silk in 4 Regional Logistics Base Club in Wroclaw, Pretficza 24 Street. Exhibition was attended by 18 women gathered around painted silk studio of Bozena Milewska from Wroclaw. I had the pleasure to take part in it as well. Images were inspired by paintings of great masters or presented own projects.